This should be the final revision. Just a few minor tweaks. The regulator is now a TPS77533 rather than an incorrectly footprinted TPS77333. Corrected the bi-colour LED wiring. Move to a smaller 4MHz crystal for the USB side of things. Shrunk it a bit as I’m no longer expecting to find any PCB bugs. Dropped the 0.1″ pin header as the TagConnect worked fine. The most obvious change is the small capacitive touch sensor PCB on the front. The previous version searches for a tag a couple of times a second. This works fine but I don’t like the idea of all the 13.56MHz EM noise pollution. This will poll for touch frequently and if it senses a touch it will poll for tags rapidly for a few seconds. In theory it could be more responsive too. Not had a chance to code this yet though. There’s is also a Login NFC the way to another implantee. I’d recommend you check out Hans Peter’s embryonic.dk blog. It’s taken some time, but it’s finally working! It’s hard to debug when you don’t know what’s at fault. Is it the PCB design? I’ve never done anything as complicated or as high frequency as this. Is the the PCB manufacture? 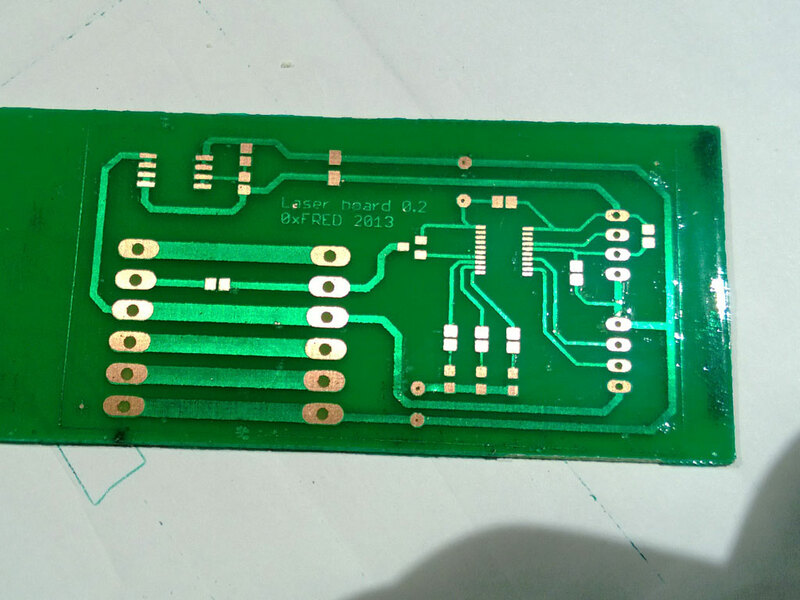 I decided to get the board made by DirtyPCBs rather than home etching, so at least that took one potential source of screw-up out of the equation. Is it my soldering? I’ve never done anything as fine as the LQFP (larger chip) and QFN (smaller one on the right). They’re both 0.5mm pitch but at least the LQFP has pins that stick out rather than just metal patches on the edges of a square block. Is it the design of the antenna? This is the work of the very talented Mathieu Stephan (from here) so probably not the weakest link. Is it the firmware? I’ve had the code running on a MSP430F5529 LaunchPad, but I’ve switched down to a smaller F5510 and reassigned the pins. Well, it took three tries – as you can see from the scribble on the board above. There’s a mistake around the TPS77333 voltage regulator which truned out to be a footprint error in the Eagle-supplied libraries. It’s now a bodged-in TPS77533. There’s another by the LED which I’ve had to swap for two separate ones rather than a red/green single package. My mistake on the pinout there. It turns out the problem was the soldering of the QFN packaged TRF7970A. Buying a microscope helped me sort it out and it’s finally there! It’s finally working! There’s more to do, of course. I need to fix the mistakes. The software could be tidier. Version 2.1 will be perfect (probably). I’ll publish the design and code when it’s tidy, but in the mean time if anyone’s interested in any of it, let me know. I laser cut a simple acrylic enclosure. It’s just black acrylic on the back – with some 5mm neodymium magnets press fitted into holes so it attaches firmly to my PC. Some clear acrylic makes up the front so I can see the LEDs and the fruits of my labours. M3 nylon bolts go into threaded holes on the rear piece. It’s been harder and slower than I expected but I’m very happy. One of the quickest ways to destroy a CO2 laser tube is to let it overheat. 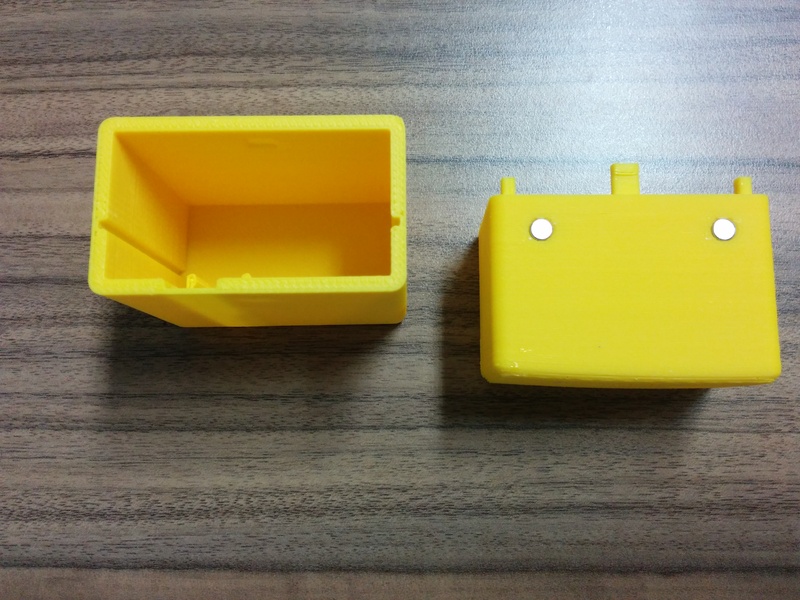 My laser has a very simple system – just a plastic breakfast cereal container of water with a small aquarium pump. It works well enough, but is easy to forget. My first modification was to power the pump from the laser so that it’s running when the laser is switched on at the mains. That gets around the “oops, I forgot” problem, but doesn’t cover a pipe coming loose or the temperature creeping up. I really wanted to actually check cold(ish) water was flowing through the glass laser tube. To check the flow, I started with a LM35DZ temperature sensor and a cheap water flow sensor from eBay. 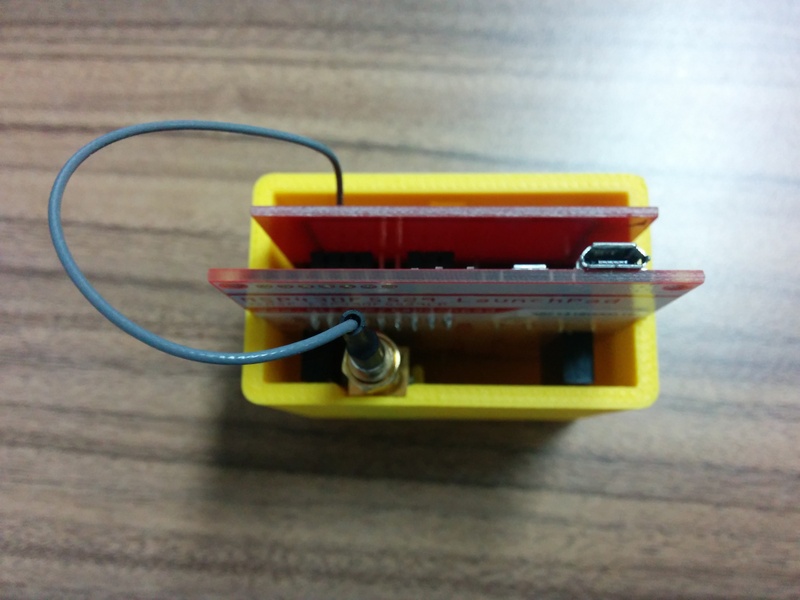 For neatness I carefully milled the flow sensor to embed the temperature sensor in it. This was then attached to the output of the laser. I intend to check that enough water is coming out and that it’s below a temperature threshold. 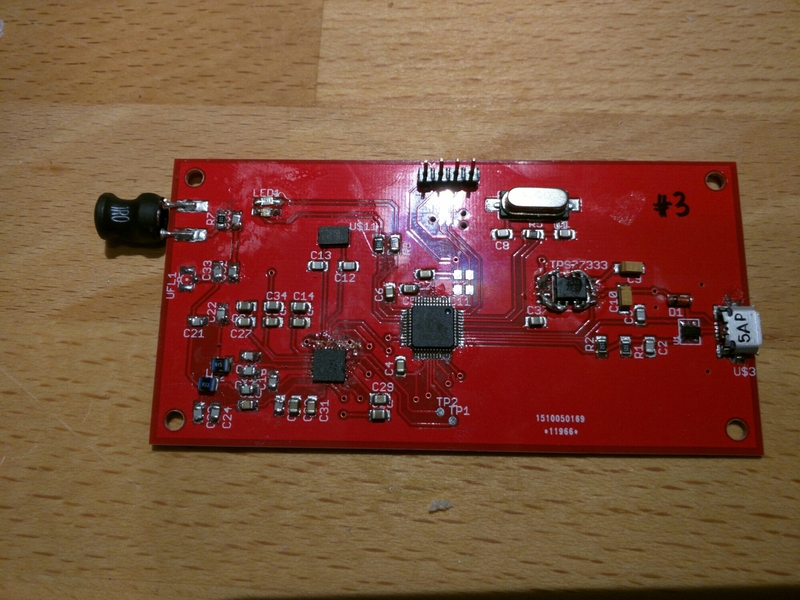 I etched a board with a MSP430G2533 microcontroller that counted the pulses from the flow sensor over a fixed timer period and used the onboard ADC to read the temperature. I set the threshold at 40C and 75% of the normal flow. My initial attempt used a MOSFET to pull the last signal down to GND if things were awry. Unfortunately this fired rather than disabled the laser! This was replaced with a 74LSxxx AND gate so I could force it to 5V and disable the active low signal. Some connectors to match the controller board meant I could drop it in with no rewiring. So far it has been working well. (I actually finished this months ago but didn’t document it.) It’s not actually been needed to save my tube yet, but it’s nice to know it’s there. 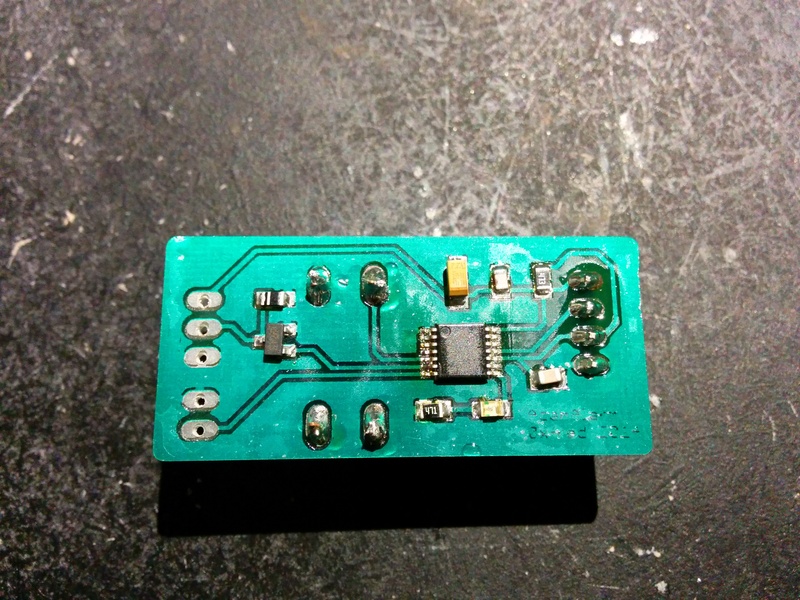 I might later and another sensor on the input and also flag if the difference between the two is too high. I could also add a cheap LCD display but that seems a little over the top. If anyone wants a copy of the PCB layout or code, just ask. 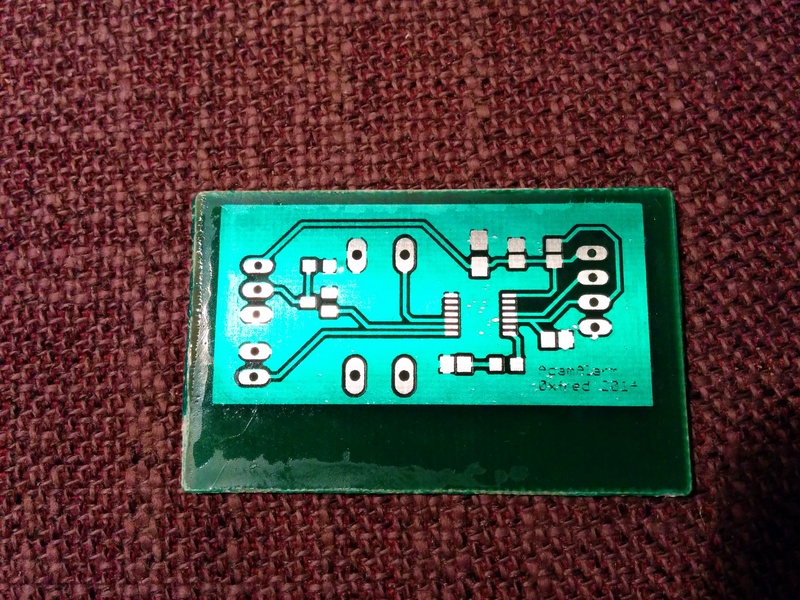 I’m glad to report I’m getting even better result with my PCB etching. Results do seem a bit up and down each time I get back to it but I feel I’m narrowing it down and getting more polished. One. I’ve started using Ziplock vacuum bags to evenly press the transparency against the PCB. A really nice cheap substitute for a vacuum light box! I can thoroughly recommend them. Two. I’m now able to get even better exposure with 3.5 minutes under the UV box rather than using the fluorescent tube. Maybe my developer solution used to be too strong. Maybe ditching the glass in favour of the Ziplock helped. Regardless, I’m getting a really good result. Here’s the partially etched board showing great definition. Three. I got some Tin plating solution. No idea why I didn’t do this before, as it’s really easy and gives a great finish. The instruction say to carefully clean the copper with an abrasive. 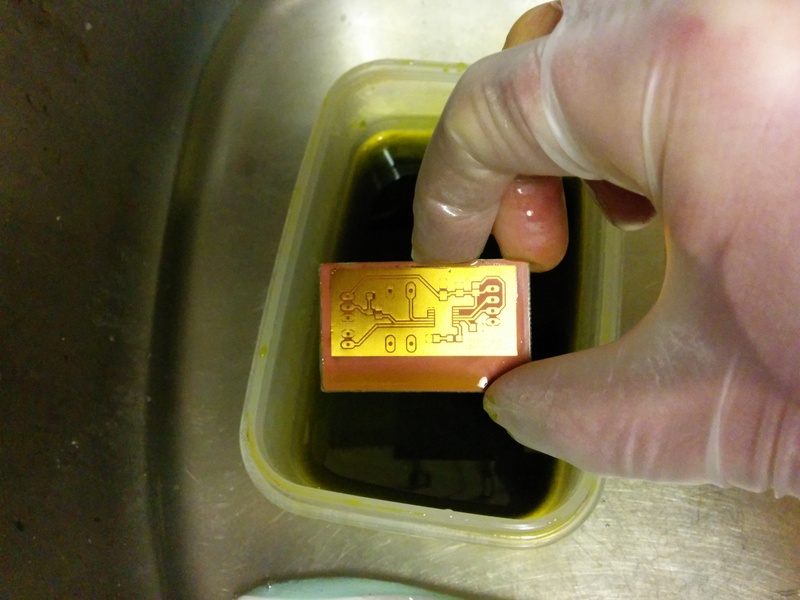 However, I assumed that as I’d just removed the etch resist from the copper with acetone and it had to be just about as clean as it could be. I popped it straight in the tinning solution before I got fingerprints all over it. I had to mess something up and I removed the protective layer on the soldermask before exposing. Some of it dulled a little on contact with the transparency. Oh well. Otherwise I’m very happy. The ridiculously small negative text even came out a little. Here’s the board before drilling and populating. 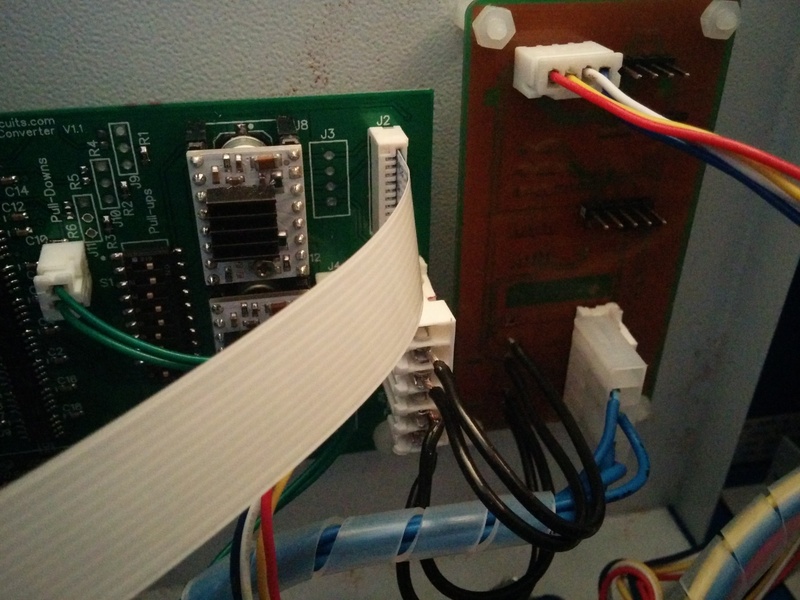 It a simple MSP430 based alarm for when my two year old son opens the front door. He can now just reach the handle. When I’ve got it all sorted (and have tried the via rivets too) I think I might do a proper write-up. At work we use Continuous Integration to build and test our code as we check it in. It helps catc problems early and ensures we keep code standards up. We were using CruiseControl.NET but have now moved to TeamCity. Anyway, this is no use unless people take notice of broken builds and this was starting to slip. I decided that something fairly visible (but not too annoying) was needed. 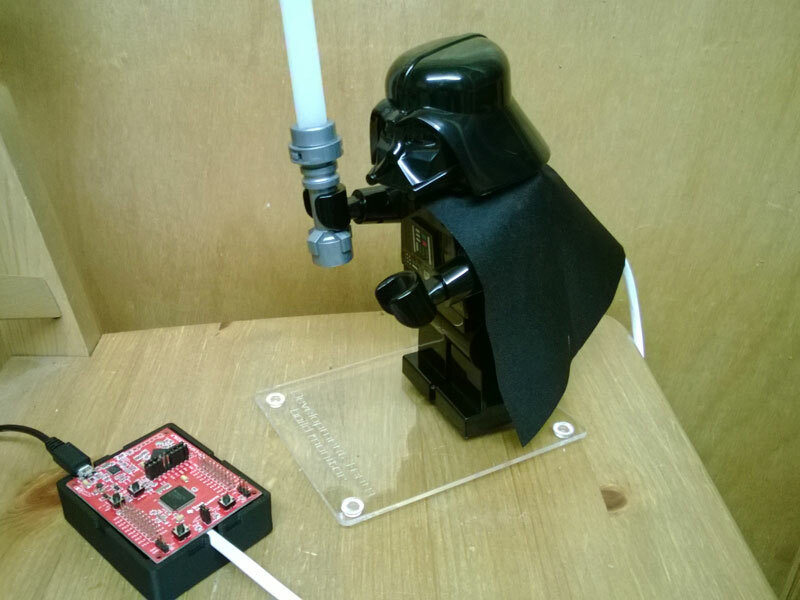 After spotting a Lego Dath Vader toy torch it seemed like a good solution. The standard toy has a button on his chest that is used to switch on some while LEDs in his feet. There was also a red LED and a AAA battery in his lightsaber so it could be switched on. 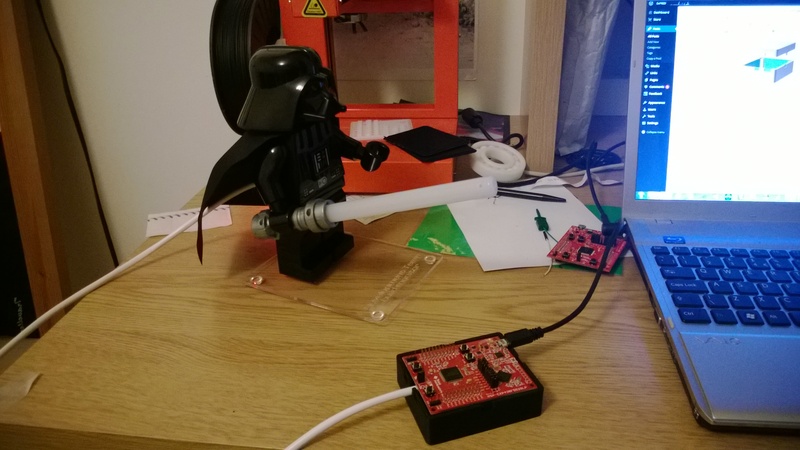 The plan was to add a servo to his arm so he could wave the lightsaber around and replace the red LED with a RGB one so that the colours could change. All of this under PC control of course. Rather than describe in detail exactly what was needed, maybe some photos of the progress will sum it up. First I had to get a servo in place operating his right arm. 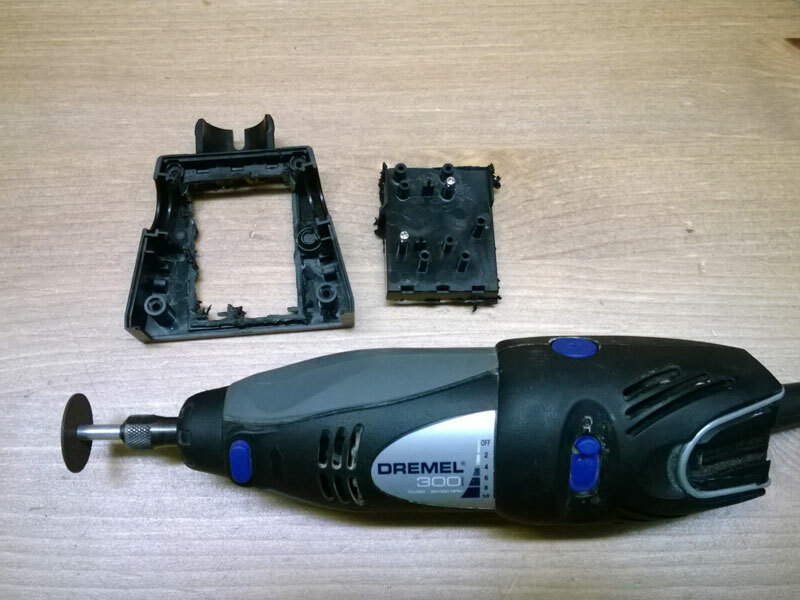 It required cutting away the battery compartment, filing the joint to make it a little easier to move and hot-gluing the servo in place. 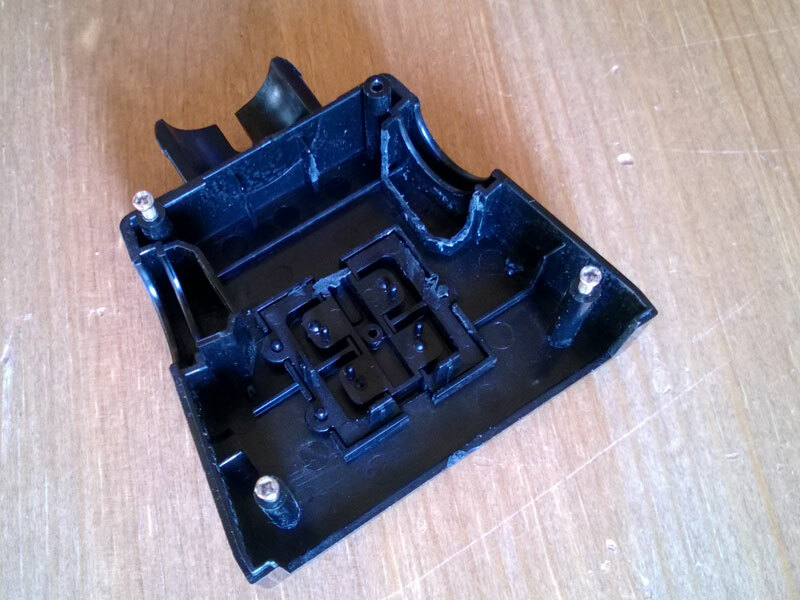 The front just involved making a bit more room to glue the servo in. 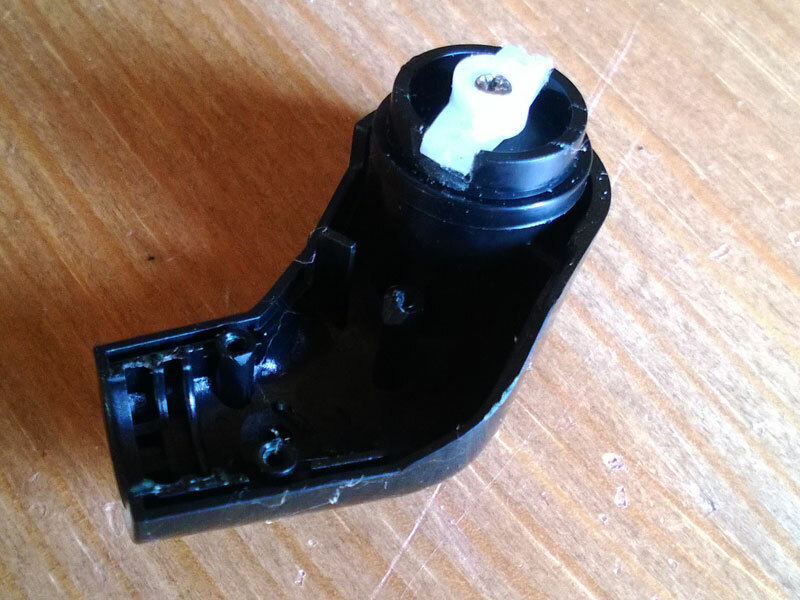 The a slot needed to be carefully added for the servo horn to drive the arm. The horn was later screwed to the servo. 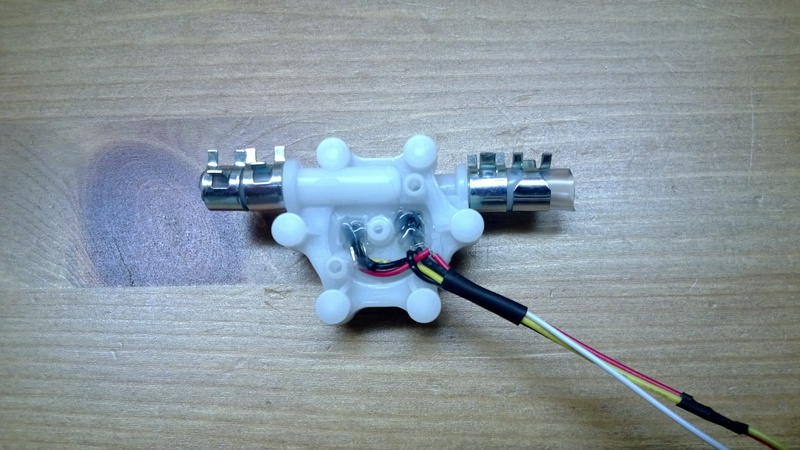 The connection between the servo horn and teh shoulder joint is just a push fit. 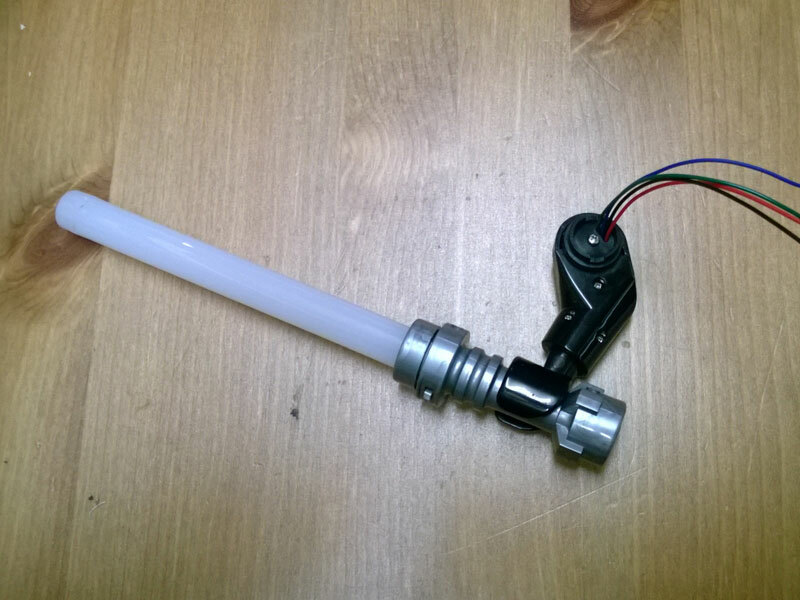 For the lightsaber, the battery, connectors, original PCB and LED had to be removed. 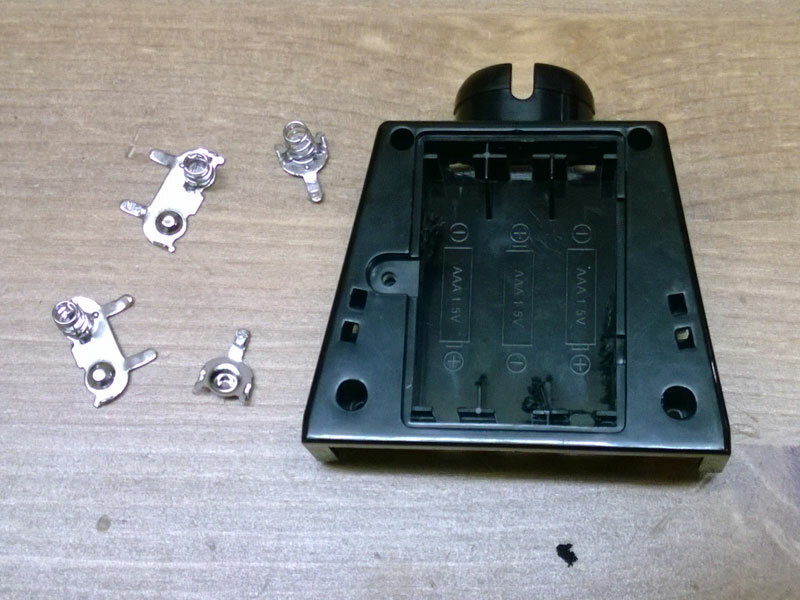 The switch was glued in place as it wasn’t to be used but needed to fill the hole. As ther was no PCB to locate the new LED, it was glued into place. 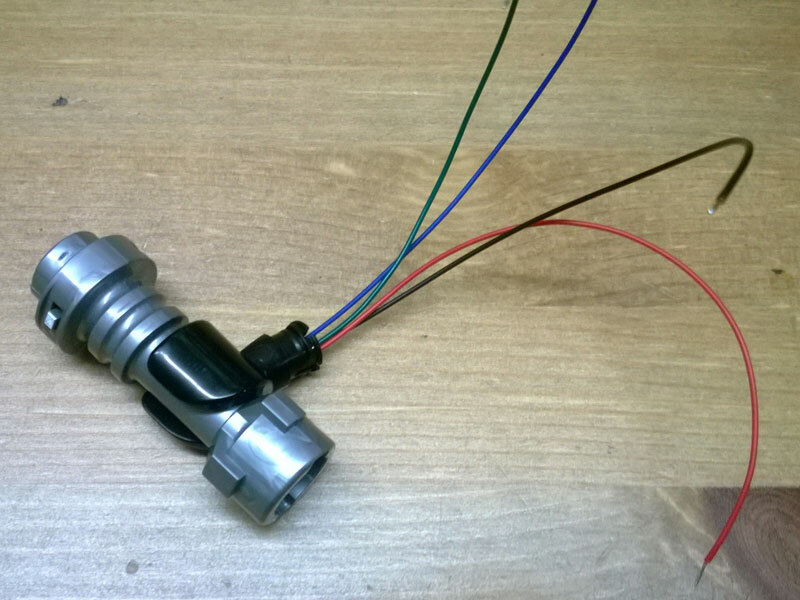 Running the 4 wires from the RGB LED involved carefully drilling a path through the side of the lightsaber, the hand, arm and shoulder joint. 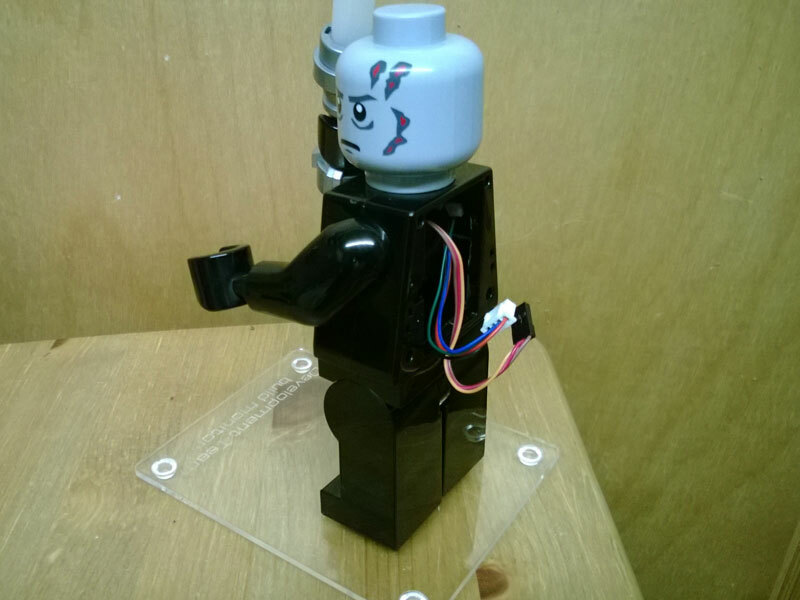 I had to be careful that the wires coming out of the shoulder didn’t limit the servo movement. The next step was putting all this under PC control. I decided that the recently release MSP430F5529 Launchpad would make an ideal control system. 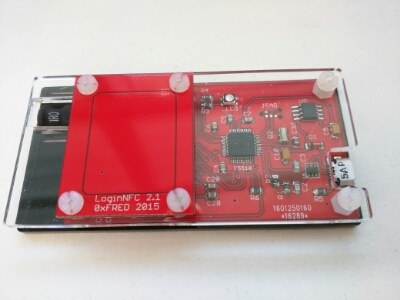 It has built-in USB functionality and could easily handle a few PWM channels. 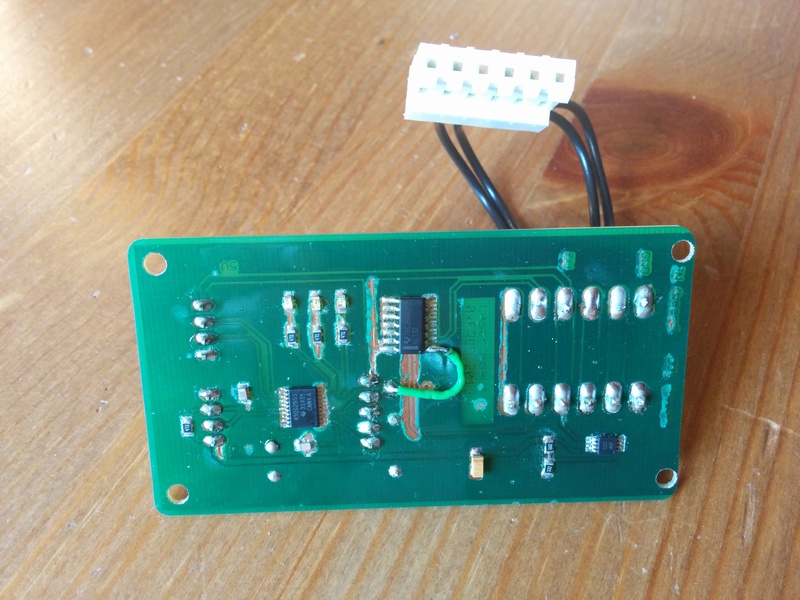 All that was required was to connect ground, 5V and a PWM signal to the servo and 3 PWM signals to the channels of the LED. The photo also shows the clear acrylic base – cut using a 40W CO2 laser. 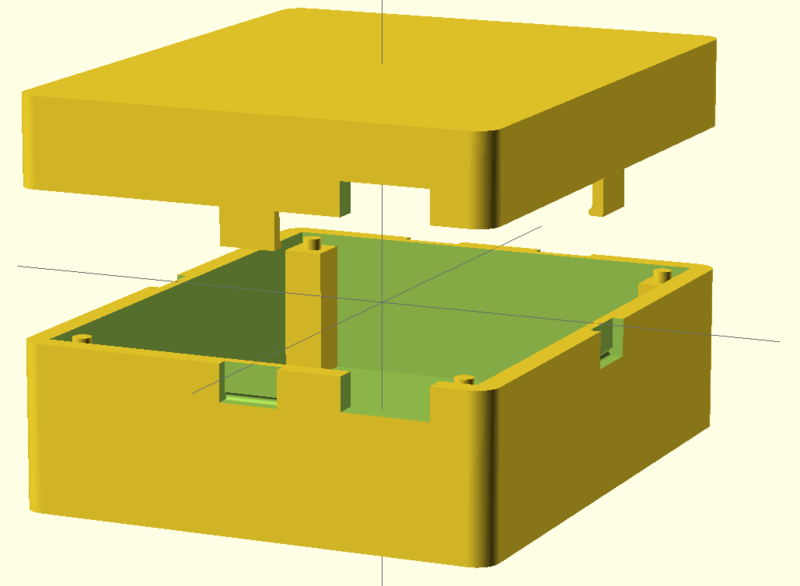 I intend to etch a small microcontroller board that will fit inside where the battery compartment was, but for the initial build uses the Launchpad externally, in a 3D printed enclosure. The connection between the device and the PC is using a USB serial port. As far as what controls Darth Vader, I tried a number of options. Initial control was done from an ASP.NET MVC web page. Anyone in the office could control him with simple URLs like fredpc/Vader/Colour/Blue or fredpc/Vader/Position/0. The connection to TeamCity proved a little more difficult. I started work on a Java plug-in for TeamCity that would call these URLs, but it was a pain to get the plug-in installed and working in TeamCity. All the documentation I could find was out of date and inconsistent – as is often the case with Java. So I went with a Windows service that polls TeamCity (using Rest APIs) every 10 minutes. Later, I realised that information like who is assigned to fix a build was missing from the APIs. Believe it or not the best solution I could find was to screen-scrape the HTML from the page used by the TeamCity Tray Notifier! I’m not impressed with the API side of TeamCity at all. I you’d like to see it working, here are a couple of videos of it in action. 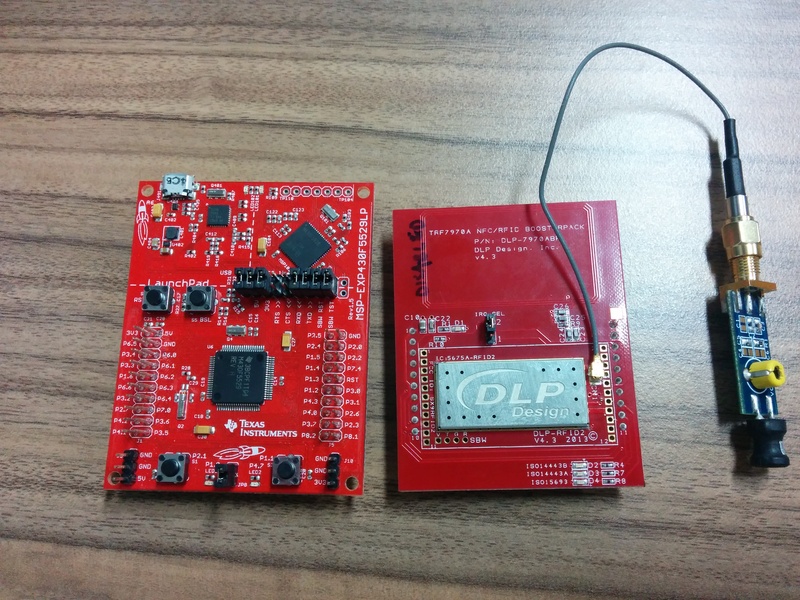 I’ve been working on a project using the MSP430F5529 – a really nice microcontroller with built-in USB functionality. The final product should get an etched board. However it has a whole Launchpad for now, so I thought I’d dust off the 3D printer and make a case. 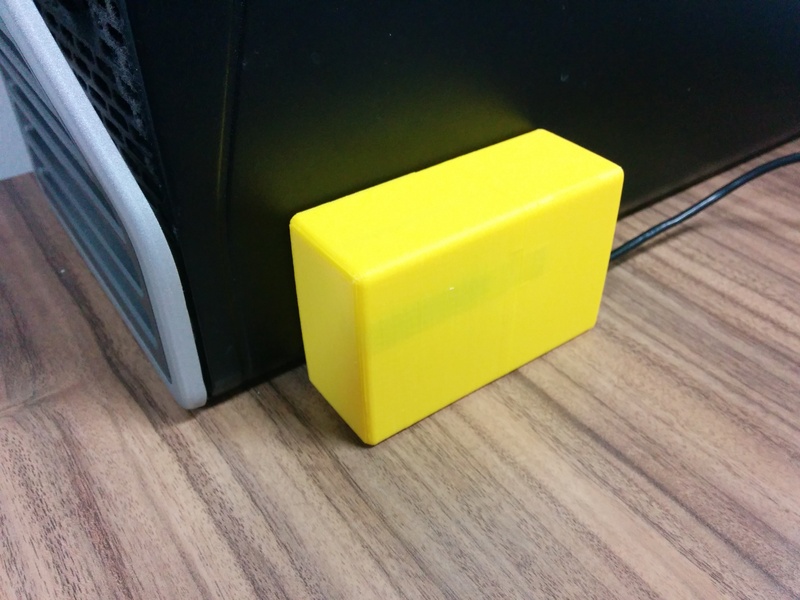 My favourite tool is still OpenSCAD so I came up with an adjustable enclosure. It should be easy to add any openings or custom bit if you want to.